The foundation is the DJ. So to celebrate this element of hip hop, I bring you volume 2 of the Sounds of the DJ series. This time through I kick things off with DJ Kryptic. You can find him at the monthly event Wax It Up at The Jack London Bar spinning a mix of Oldschool Hiphop, R&B, Funk, Nu Funk, & Breaks. This week he stopped by the KZME studios to share a taste of what you can expect when you see him live. Check out the 1st hour of the podcast to hear DJ Kryptic’s live mix on Welcome to the Neighborhood! In the second hour of the show, I was privileged to have a conversation with local artist Rafael Vigilantics. 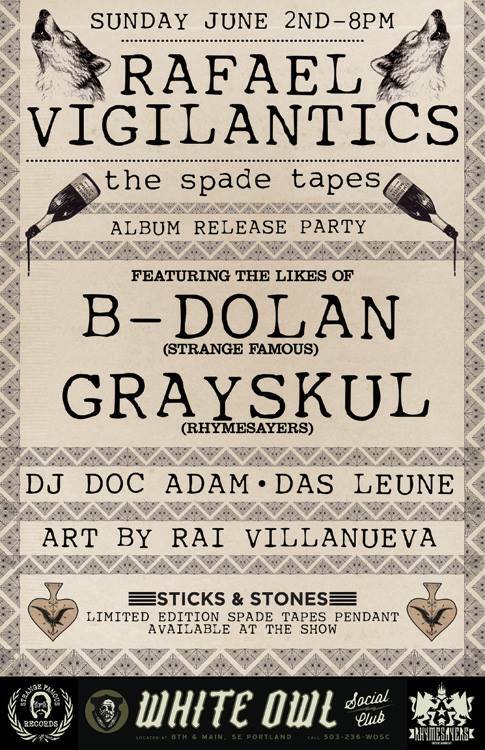 He is getting ready to release a new project entitled The Spade Tapes and there is an album release event happening on June 2nd – and we’re all invited. Check out the second hour of the show via podcast to hear a couple of tracks from the project as well as a conversation with the man himself. Next week I continue the series with a mix from guest DJ Weather so be sure to spread the word.